Water sports, romantic hideaways, golf courses and top-notch, on-site restaurants – you name it and Florida resorts have it! Are you looking for a resort that provides a romantic getaway or a family-friendly haven that has numerous fun activities to enjoy? Look no further! These resorts are true island escapes with secluded, pristine beaches and colorful nightlife attractions where first-class service is the standard. Known for its fantastic views, this hotel faces the Intercostal Waterway allowing for every room to have balconies right on the beach. After admiring the magnificent views, you have the option to lie out by the infinity pool overlooking the ocean or indulge in the luxurious features of the resort’s spa. Do you like the best of both worlds while on vacation: beach and city? If so, this hotel is definitely for you! Enjoy exclusive guest privileges at the private Seagate Beach Club and Country Club or shop at the two boutiques within the hotel. Talk about the finer things in life! This resort is renowned for its four pools, 25 daytime bungalows, indoor and outdoor fitness center and nine restaurants. In addition, there are two championship golf courses and 12 on-property shopping boutiques. There truly is something for every guest. Are you looking for a couple’s getaway or a family retreat? With its spa, four restaurants, fitness center, tennis amenities and golf, you will never run out of things to do. To top it all off, each guest room has a private balcony. Discover true relaxation at the resort’s four private pools where you can enjoy poolside treats including snacks and drinks. This resort is known for having the largest rooms and suites on the island. Experience a romantic hideaway where US presidents and celebrities frequently visit. Truly secluded, you can only get to this resort by boat or plane. Expect full decompression, disconnected from your electronics. Escape to this highly rated resort that is celebrating 90 years of providing top-notch service. This resort is a great haven for both couples and families with its oceanfront golf course, four pools that are designated family-friendly or adults only, a mini water theme park and a fitness center. Indulge in old Florida sumptuousness at this grand resort. Relax in the Lazy River or zero entry pool. This resort is perfect for every type of vacation. Located on pristine beaches in Palm Coast Florida, this beach resort is perfect for friends and families. Kids will enjoy the water park that includes a lazy river and water flume, while couples will enjoy the oceanfront restaurants and spa. Experience a family vacation like no other. Parents can enjoy time to themselves while kids explore the AquaNuts facility; a place to climb reefs and caves, play games, make crafts and take dance lessons. Placed in the excitement of South Beach, this resort is near “premier events like the world-renowned Art Basel” and Ball Harbour Shops. The resort features two pools, a spa, butler service, Kids’ Club and fitness center. Relish the island life by staying at this secluded resort that can only be accessed by complimentary ferry. 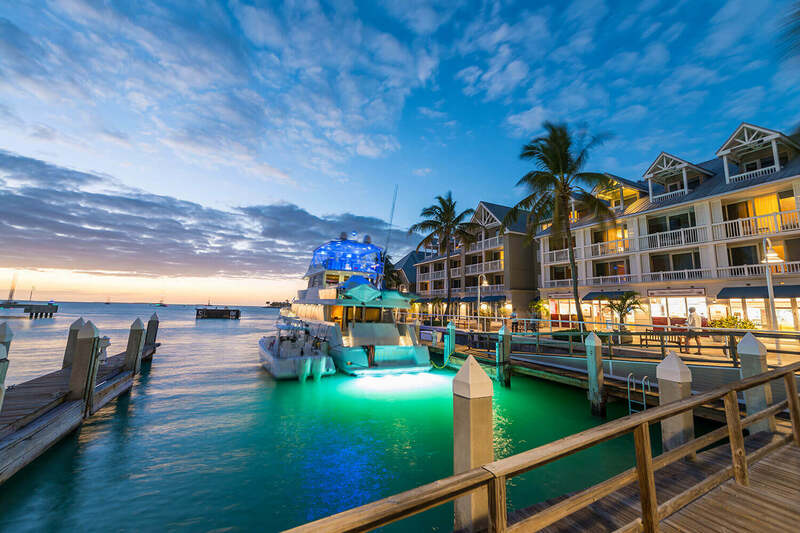 Enjoy tennis, relaxing by the pool and water sports by day and visit Key West by ferry at night for shopping and attractions. Known for its wealth of activities, this resort has it all from marine-bio-inspired activities for the younger children, to oceanfront soccer, basketball, swimming and board games for all ages. Experience a vacation with no worries and lavish accommodations such a personal concierge that takes care of your every need. This resort is family-friendly with on-site nannies so couples with children can have romantic time at the spa or on-site restaurant. Indulge in this resort’s four restaurants and bars or their private beach with a heated outdoor pool. Still not enough? They also have a spa that includes a hot tub, fitness center and steam room.